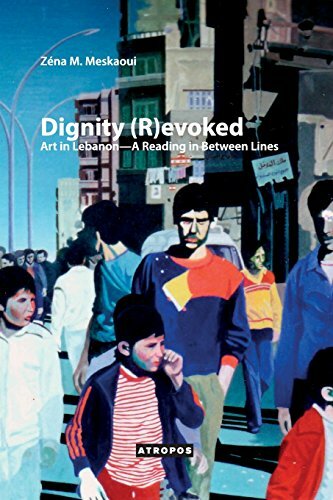 Dignity (R)evoked: Art in Lebanon­—A Reading in Between Lines, puts forth the concerns of artists and writers in the human ‘worth’ or ‘value’ (qimat el insan). The author examines a number of relevant artworks of Lebanese artists, Samir Khaddaje, Rabih Mroué and Lina Saneh (Majdalanie), and text by author, Dominique Eddé, produced during and after the Lebanese war (1975-1991). She exposes an underlying shared quest by the artists that revolves around the notion of dignity and critically interrogates related concepts such as sovereignty, autonomy, and freedom. She argues that the pursuit of dignity, a dignity that lies outside the realm of politics or even ethics is shared by the artists, despite the difference, in generation and context, in media and medium, and in their presumed underlying theories. The study examines the artists’ production it terms of its aesthetics, media, and forms of production between personal narratives and personal expressions, the context from which the works stem, and the connections between these artists’ practices and the art scenes in Lebanon, during and after the war. The research identifies and examines, shared motifs like silence, ruins, the human figure, and the body, and highlights the continual shifting boundaries between historical, social, political and cultural realms.